Resistance thermometers (RTD, s). Type K, T, J, E, R, S and b Thermocouples. 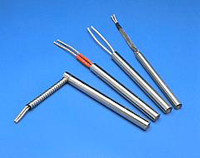 Mineral insulated thermocouples. Protection sheaths. Transmitters. Thermocouple cable. Related accessories. Cartridge heaters. Band heaters. General purpose thermocouple sensors are suitable for general purpose applications up to a temperature of 400�C. The sheath material on these temperature sensors is 316 stainless steel and they have a grounded junction for fast response to temperature changes. Available in thermocouple types: K, T, J, N and E as simplex or duplex units. Wide choice of terminations available e.g. terminal head, connector, cable, temperature transmitter etc. Suitable for general purpose temperature measurements. Bayonet thermocouple sensors are suitable for use in plastics machinery and general purpose applications with an industry standard single slot bayonet fitting. The fitting can be fine tuned for positioning on site, the sensor can also be bent to fit unusual angles. 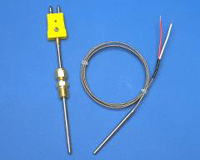 Available in thermocouple types: K, T, J, N and E.
Stainless steel armoured leads available. Platinum Resistance Thermometer, Thermowell, Extension Piece and Terminal Head Assemblies. Custom made thermowells to suit any application are available with a wide choice of attachment mechanisms (flange, screw connection etc) and can be with integral platinum resistance thermometer sensors, extension pieces and terminal heads. Available in 2, 3 and 4-wire simplex or duplex configurations. 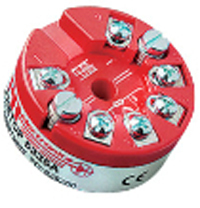 Wide range of thermowell diameters, lengths and configurations. Custom built to your exact requirements. Wide range of attachment fittings available. Mineral Insulated Metal Sheathed Thermocouple Assemblies. Mineral insulated thermocouples are extremely robust temperature sensors suitable for use in arduous conditions over the temperature range: -200�C to +1250�C. Sheaths can be generally be bent, twisted and flattened to suit applications without impairing performance. Available in thermocouple types: K, T, J, N, E, R, S, B, C and D with sheath diameters from 0.25mm to 12.7mm. Wide choice of sheath materials e.g.. stainless steel, Inconel, Pyrosil etc as well as more exotic materials such as Hastelloy, Platinum and Molybdenum. Temperature transmitters cover every application within transmission of RTD and TC sensor signals into mA, mV, HART, PROFIBUS� PA and FOUNDATION� Fieldbus communication. 'Smart' Head Mount temperature transmitters which accept most commonly used temperature sensors (also slide-wire sensors or mV inputs) and generates an industry standard transmission signal. Output range and other operating parameters are easily programmed using software running under 'Windows' without the need for re-calibration. Isolation is a standard feature to overcome any potential ground loop effects. Two microprocessors operate together to ensure error-free transmission across the isolation barrier. A sensor referencing facility enables the transmitter to be accurately matched to a particular sensor. ThermaCheck� samples, validates and records critical temperature points at multiple locations or process accurately storing over 10,000 readings. ThermaCheck�s management software allows efficient and effective corrective action within food processing, storage and preparation areas. Mica Insulated Strip heaters / Plate heaters are sheathed in rust-resistance steel or in stainless steel sheath as it provides physical strength and good thermal conductivity. Specially selected mica grade and thickness is used to insulate the windings, providing excellent thermal conductivity and dielectric strength. These heaters are available with various terminal options: Screw terminals / Pin socket or with flexible wire leads. Various mounting holes can be provided as per customer specifications. High quality, high watt density cartridge heaters for plastics processing, packaging, hot melt dispensing, liquid heating, hot plates, and other and a variety of other applications. Swaged (compacted) cartridge heaters provide long service life at elevated temperatures with a wide range of termination options that can be adapted to most applications. We can assist you with proper specifications for a new application or help you solve a problem with your existing design.